Errol: This is why we record separately. 😀 Poor Debs. I think recording is the worst thing in the world for her. Debs: This kind of happened actually. At one point when we were close to done, I could have sworn I head a wrong word in a the chorus. Fortunately I misheard or it would have meant rerecording 4 or 5 tracks, which would have really sucked. 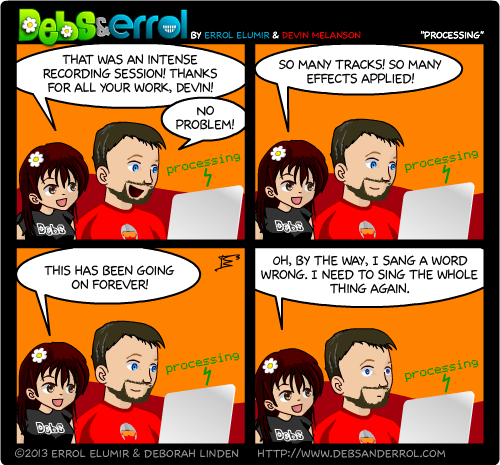 Yeah, recording doesn’t mix with perfectionism. I’m looking forward to recording with Errol next week though. Tracking our vocals at the same time will definitely relax the process. But the most important thing is that “Tribbles” is done and it’s great. ← Send us Your Submissions for Comic 700! Devin has mentioned that everyone approaches recording differently. Some people do hundreds of takes. I, on the other hand, am all, “Eh…the errors make it spicy!” I think I`m simply lacking the patience to record something seventeen thousand times. I love how she’s so jovial when she says she’ll have to do it all over again. I bet that’s not how it really happened. I would probably record like Kari too. Any time my mom takes pictures of things like family or product for my dad’s business (he’s a blacksmith), she always ends up at her computer comparing all of the shots to decide which is the best. I’ll go in there to look at them to help her, and it takes me a few seconds to pick one, while she’s still deciding between two that are nearly identical. Drives me crazy; I am so far from a perfectionist…until it comes to my writing. You have a dad that’s a Blacksmith?! That’s cool! AWESOME! Does he do commission work? He does, though the first thing I usually have to tell fellow geeks and gamers is that he does not make swords or knives. He’s also very behind on custom orders right now, so we have to tell people the lead time is at least 6 months. My dad’s work is probably the most interesting thing about my life to other people. We do period reenactments on many weekends throughout the year, dressing up in clothes from pre-1900s, setting up a canvas tent and the like. While I do love swords and knives, I actually don’t know if I’d ever have one custom made unless I was physically there, since I’m so picky about heft and balance and hilt, and I know what I look for is not what most people look for in those respects. Actually, what I want is chain mail. I’ve wanted a good set of chain mail armor for eons. Well, chain mail and decorative pieces. With this crowd, perhaps I should have gone to armor before I went to weaponry anyway. Yeah, he doesn’t make anything like that. He mostly makes camping equipment. Ah. I… have never been camping. Dang. Oh well, t’was a thought. Actually, my husband is a blacksmith too; he’s been working for my dad for about 3 years now. I’ve been working for my dad for a lot longer, but I mostly stick with bookkeeping, so no one could mistake me for a blacksmith. Yeah, bookkeeping can be awesome too! I love bookkeeping, you should see my shelves, I keep tons of books. (Bad joke, sorry. One of the best lines from the first Elantra novel was when a poor girl from the fifes was being shown around the big city and they showed her the book makers, and she asked about the odds. I kind of fall somewhere in the middle. On the one hand, I really want to do a good job and will ask for extra rehearsal and want to fine tune everything. On the other hand there comes a point when I just say “Screw it. It’s good enough.” Although poor Errol had to endure me begging him to give me more takes for NaNoMusical. He let everyone else have them!